Great location if you are visiting EPFL or looking to stay near Lausanne. Comfortable beds and spacious rooms in a nice setting. Lively bar and ample parking space. Nice breakfast, The location is very close to EPFL. Although it was a little far from the city. Not far from the lake and it was a great experience for a jog in the morning. The hotel provides a shuttle to the city for free and there tram line/bus station not far away. It is great that the Hotel give me the same room that I lived during my honeymoon. It is so nice of you. Helpful and nice personal, very good. The rooms are very nicely designed. And the design works, which isn't always the case elsewhere. The breakfast buffet is a dream! Room was great, clean and comfy. 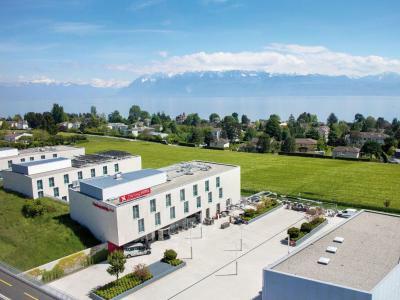 Silent so easy to sleep, fantastic view in the morning and walkable distance to EPFL (or UNIL) which was the purpose of my stay. I can only recommend for those traveling to EPFL (or UNIL). Tram or buses are convenient to travel downtown.